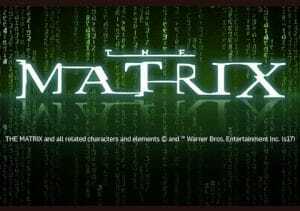 The Matrix proved to be one of the surprise cult movie hits of the 1990s and now the sci-fi classic has got the video slots treatment. Created by Playtech, it’s a 5 reel 50 payline game that comes with quality design and some terrific extras. Look out for morphing stacks of wilds and a pair of free spin rounds where added matching symbols and sticky wilds are added. Play on your desktop, tablet or mobile from 50p per spin. The Playtech design team has kept things close to the original movie as far as visuals are concerned. With lines of green digital code flowing behind, the reels include letters as well as telephones, sunglasses and a trio of characters from the film. You won’t see much of Keanu Reeves but you will see Agent Smith (Hugo Weaving), Trinity (Carrie-Anne Moss) and Morpheus (Lawrence Fishburne). All of these symbols can land fully stacked. Joining the standard wild is the black cat which is a second wild -this can land on reel 5 only. When it lands fully stacked on reel 5, you’ll trigger the Déjà vu Shuffle feature. The stacked wild will duplicate itself onto reel 1. The symbols are then shuffled and a new payout is made with the extra wilds in position. Agent Smith Free Games feature – here you’ll be awarded 8 free spins. On each 1 of them, extra strips of the Agent Smith symbols are added to the reels. By the close of the feature, Agent Smith dominates the reels, making it that much easier to land a potentially big winning combination. Nebuchadnezzar Free Games feature – the number of free spins on offer here isn’t defined. Watch out for the sentinel wilds (the spider like creatures) – when these hit, they will lock in place. If a portal lands, all of the sentinel wilds are blasted off the screen. The feature continues until you have 6 sticky wilds in play at the same time. The video slot version of The Matrix might lack the film’s biggest star but it makes up for it in other ways. The design is excellent and an ideal fit from the film. The range of extras isn’t as wide as we’ve seen in some Playtech game but none the worse for that. Both of the free spins rounds offer plenty of potential. This offering from Playtech is a good adaptation of a classic film. Combining high-end design with a pair of cracking free spins rounds, we’re happy to recommend entering The Matrix. If you like movie video slots, there’s plenty to choose from with Microgaming’s Jurassic World and Playtech’s Top Gun recommended.